I've been running for fifty-six years times a conservative 2,000 mi/per so I'm well over 100,000. I began running formally when I was fourteen. Quit the college team freshman year, but ran even more because it infuriated the coach. 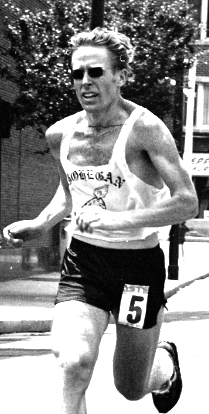 I remember running 110 miles in a week preceding an East Lyme marathon, and then raced a comfortable 2:24. That's when I was working 8 miles from home, and running to work Monday through Friday. I'd be home by 5 pm and had gotten in 16 miles. Idyllic! I have had hernia surgery and two meniscus surgeries, each laying me up for 3 - 6 months. But other than that, it's been flat out addiction. Many have asked if I ever kept a log? No, because then I wouldn't have had time to run.